Grimes Field, located about 1 mile north of Urbana is a small airfield that opened in 1942. Named for Warren Grimes who moved to Urbana in 1930, when he founded Grimes Manufacturing, a small lighting fixture plant. What makes Warren noteworthy is that he invented the familiar red, green and white navigation lights found on the wing tips and tails of aircraft throughout the world. Grimes became known as the "Father of the Aircraft Lighting Industry" and during World War II, every American-made airplane was equipped with Grimes red-green-white lights. Grimes also served as mayor of Urbana and chairman of the Ohio Aviation Board. Originally manufactured as a Beech C-45H transport aircraft for the U.S. Air Force in 1953, it was acquired by Warren Grimes in 1963 to be used as a lighting demonstration aircraft. Over the years the aircraft regularly was flown at air shows around the world and continued being used as a laboratory to develop new lighting products. In 1986 the plane was damaged at an air show and sold for salvage. In 1999 the plane was purchased by Honeywell (which had purchased Grimes Manufacturing) and moved the damaged and dismantled airplane back to Grimes Field for restoration. 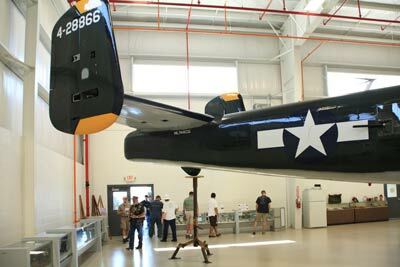 Volunteer worked on the restoration project and the plane once again began flying out of Grimes Field in 2008. The Grimes Flying Lab Foundation was formed to handle the restoration of the aircraft. 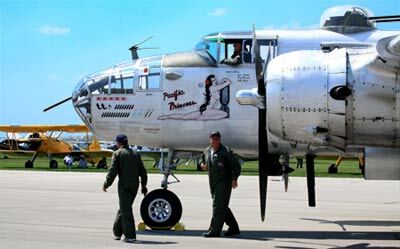 Grimes Field recently played host to 20+ B25 Mitchell Bombers that were taking part in the 65th Anniversary of the Doolittle Raid on Japan, April 18, 1942. 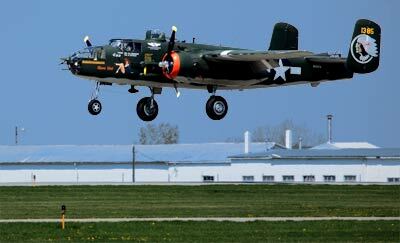 The B25s assembled at Grimes Field over 2 days, and then took off for an even larger event honoring the survivors of the raid at USAF Museum in Dayton. The Frigidaire manufacturing plant in Dayton built a number of parts that helped make the bombing raid possible, including the special reserve gas tanks installed on the B25s that extended the flying range of the 16 B25s taking part in the attack. Frigidaire also made the 3-blade propellers used on the B24 Mitchells as well as those on the B17 Flying Fortress, the B24 Liberator and a number of other aircraft used during the war. Towards the north end of the airport is a new building that houses the Champaign Aviation Museum. Besides having some interesting planes and memorabilia on display, they also have something they call the B17 Project. 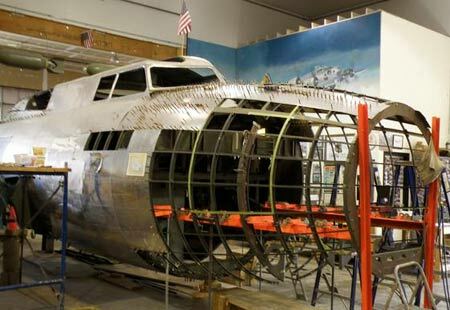 The B17 Project is just in the beginning stages of a project expected to take about 10 years that when complete, they will have completely rebuilt a B17G bomber called Champaign Lady. 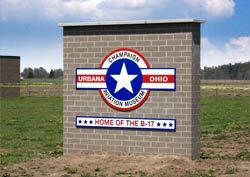 Visitors are welcome to see the B17 project any time week days 8am to 4:30pm, and Saturdays from 9:00 am to 3:30 pm (closed Sunday). 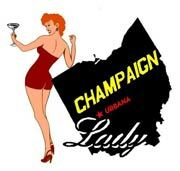 Call 937-484-6947 to volunteer or schedule a large group tour.